The Ink Trap: A new challenge at Art Impressions: Cards with a window/opening! 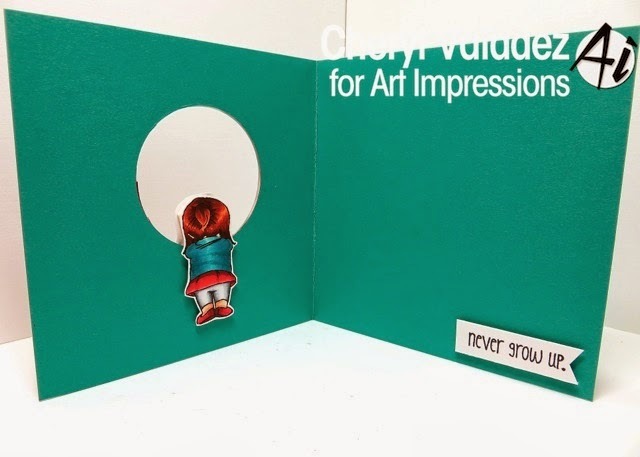 A new challenge at Art Impressions: Cards with a window/opening! Hey, everyone! Welcome back! We're introducing a new challenge this week on the Art Impressions Blog and we're showcasing our brand new Mini Front and Backs. These are sweet petite images, quick to color, and FUN to use on a card. I've used Boy & Girl Mini set #4403. She's a doll! Find these images and MORE in the Ai Shop! Head on over to the Art Impression Blog and check out all of the wonderful samples created by our ridiculously talented DT. As you can guess...the challenge this week is to create a window or opening on your card. Find all of the details on the blog. Okay, I've got to scoot! Until next time, stay crafty! Your card is just adorable! Love how you colored the little girl. This little girl is so cute Cheryl!! Beautiful card. Adorable image, and love that ribbon you added to this cute card! !